T-bones, cut from the front section of the cow's short loin where the tenderloin narrows, command a premium price as popular special-occasion orders at upscale restaurants. Most steakhouses cook beef over open flames, and the T-bone makes a good candidate for your backyard grill. Take care, though: the leaner tenderloin cooks more quickly than the strip side of this dual cut, so you need to keep it farther from the flame to achieve your desired doneness for the meat on both sides of the bone. Crosscut from the forward section of the short loin on a steer's middle back, a T-bone steak contains a strip of the top loin and a chunk of tenderloin, both desired cuts on their own. A T-shaped bone from the lumbar separates the two pieces. The tenderloin filet on the larger porterhouse cut—essentially the same steak but for the size—must be at least 1 1/4 inch at the widest point to qualify for the designation; the rules say a T-bone must have at least 1/2 inch. The T-bone is largely an American cut. In the British Commonwealth countries, the strip side of the T-bone is known as the porterhouse while the tenderloin section is known as the fillet. The T-bone is made for grilling. Generous bits of fat keep it moist while the tenderloin heart stays tender and flavorful. The intact bone provides a sturdy handle to grab the steak and flip it without puncturing the meat and losing flavorful juice or sparking a flare-up. Stereotypically, this good-looking steak stars on backyard grills in commercials and is often a favorite of the outdoor chef. The steak needs little adornment and should be lightly oiled, judiciously seasoned, and cooked hot and fast. It is important to note that the slowest cooking portion of this cut sits right in the bend of the bone near the base. This area will remain rarer than the rest of the steak. The fastest-cooking portion, the filet, should be positioned farthest from the fire or it can end up overdone by the time the strip cooks through. It's possible to cook a T-bone in the kitchen, with the stovetop-to-oven method yielding the best results. Start with a quick sear in a smoking hot cast iron or another ovenproof skillet, then transfer the steak to a 425 F oven until it reaches the desired doneness, from five to 15 minutes depending on the thickness of the cut. Use an instant-read thermometer for the most accurate temperature, and gauge it in a section of meat located away from the bone. What Does T-bone Steak Taste Like? The T-bone contains a portion of tender filet and a portion of beefy strip loin, giving you the best of both worlds in one steak. Hankering for a steak? T-bone makes a great choice for a special occasion or any time you feel like treating yourself. Look for T-bone steaks at your grocery store or a specialty butcher shop. This popular cut commands premium prices, but compared to the cost at a steakhouse, a home-cooked steak dinner is an affordable way to treat yourself to an upscale meal. 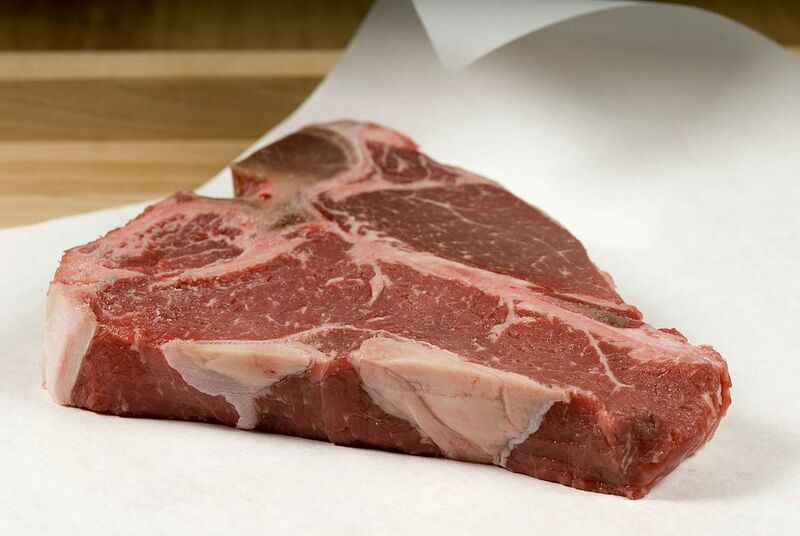 Avoid anything labeled as "thin-cut;" a T-bone steak should ideally be at least 1 1/2 inches thick. If you cannot find anything in the meat display, ask the butcher to cut it to order. In general, you can store most any cut of steak, including T-bones, in the refrigerator in their store packing for up to 48 hours. For longer storage, tightly wrap the steaks individually in plastic wrap or butcher paper and freeze them for up to three months. For best results, use a vacuum-sealer to keep them fresh and freezer-burn free for up to six months. T-bone steak delivers 23 grams of protein per serving, plus nearly a third of daily value for vitamin B12, and good doses of riboflavin, niacin, and vitamin B6. It also provides beneficial trace minerals such as zinc, selenium, and iron. But it's best consumed in moderate quantities because it's also high in fat and cholesterol. A 3-ounce serving of T-bone steak delivers a reasonable 180 to 210 calories, depending on the amount of marbled fat and how closely you trim the exterior fat, but it also packs up to 14 grams of fat, with saturated fat accounting for nearly a third of the total. However, the average T-bone weighs about 12 ounces and they can tip the scales at 24 ounces, so you need to multiple the nutrition per serving information depending on the amount of steak you eat to get an accurate data.